Principles and Practice of Soil Science, Fourth Editionprovides a current and comprehensive introduction to soil science for students in the fields of environmental and agricultural science, ecology, soil and land management, natural resource management and environmental engineering. Covers all aspects of soil science including soil habitat, processes in the soil environment and soil management. Emphasizes the applications of soil science to the solution of practical problems in soil and land management. Highlights real world examples drawn from the author’s international experience in the field. Features new problem sets and questions at the end of each chapter, designed to reinforce important principles. An answer key is provided at the end of the text. Robert White holds degrees from the University of Queensland and the University of Oxford. He has extensive international experience in Australia, Southern Africa, England, New Zealand, China and the USA, focusing on soil, water and nutrient management in broad-acre cropping, grazing systems and vineyards for wine production. He is Emeritus Professor of Soil Science at the University of Melbourne and author of Soils for Fine Wines. Part 1: The Soil Habitat. 1 Introduction to the Soil. 2 The Mineral Component of the Soil. 3 Soil Organisms and Organic Matter. Part 2: Processes in the Soil Environment. 6 Hydrology, Soil Water and Temperature. 9 Processes in Profile Development. 11 Maintenance of Soil Productivity. "Principles and Practice of Soil Science provides a current and comprehensive introduction to soil science for students in the fields of environmental and agricultural science, ecology, soil and land management, natural resource management and environmental engineering." "This clearly presented fourth edition, liberally illustrated with figures, graphs, tables and colour photographs is well suited to educate a wide audience about soil." "...the author deserves to be congratulated on the production of the third edition of a well respected and useful book which I am pleased to have on my shelf." "The book is an excellent compilation of soil science concepts and principles, skilfully accomplished in 244 page, including a very generous use of figures, graphs and tables within each chapter." "I will be happy to recommend this new edition, just as I recommended the first, as the preferred text for students taking introductory courses in soil science." "This clearly written and attractive publication on basic concepts of the properties and behaviour of soils is written for students in soil science as well as for those whose main interest lies in agriculture, forestry, ecology or geography"
"In short, it would be difficult to conceive of any initial course of instruction on soils which would not benefit from use of this original and refreshing presentation." "A most useful book for first or second year soil courses in Geography"
"In general the choice of material is excellent, covering all major areas of interest"
"It is very well written and produced with excellent and copious illustrations and suggestions for further reading ... It is an important addition to the literature at this level." 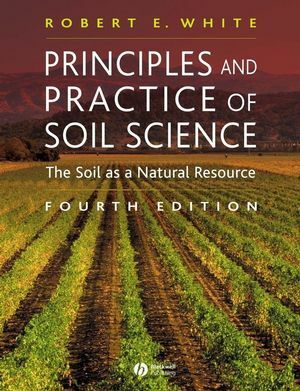 "For those teachers, for whom White's Principles and Practice of Soil Science has been and remains their choice of textbook, this new edition will be most welcome...it is now more international in appeal and teachers anywhere in the world are likely to find it valuable. If you are thinking of changing your teaching text, then I suggest that you give this new edition a close look, it has much to commend it." You may download the artwork from the book here. You will require "Winzip" (PC) or "Stuffit Expander" (Mac) to access these files. Fully revised and updated to provide a comprehensive introduction to soil science.